I bought this Jalie skinsuit pattern a while ago thinking it would make a good basis for rashie tops for the beach. 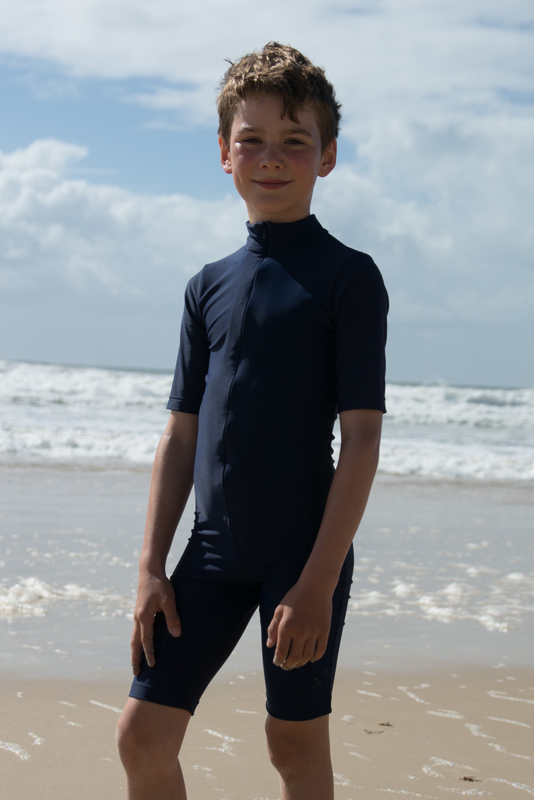 However, once P saw the skinsuit he wanted one - not just a top, but the whole onesie for the water! Furthermore he was insistent that it should be navy blue with no contrast colour, no bright stitching, no highly visible bits... Nothing in fact to make it possible to spot him amongst the waves, or for the sharks to know that he wasn't for eating. At least it would be sun smart. Sigh. So, it's a plain navy, lycra skinsuit and perhaps not much to write about. The fabric is some of that seemingly endless supply of cheap, navy lycra I bought about 3 years ago. You're probably thinking this is one example of me writing a blog post just because that's what I do every. single. time. I sew something. But you know, I am insanely delighted with this skinsuit. I couldn't help myself but think how awesome it was whenever he put it on. The fit is superb ("l" width and "n" length - exactly as per his measurements) and it just worked as a beach-y swimsuit. The front has an invisible zip which I was worried might not handle sand, but has held up just fine. There's a zipper shield that runs the length of the zipper and he was very happy with how it felt when riding his boogie board. I don't think it would be too tricky to move the zipper to the back and put in a chunkier zipper with a pull tab almost like a wetsuit. Of course then he spotted that lady in the blue suit with a hood - A HOOD MUM!, and now he has his heart set on a full length, hooded skinsuit. I have no idea why, it's not like he's a pro speed skater or even a CatWoman fan, but his fashion sense always cracks me up and I like to say yes probably more often than I should! I can see why you like it so much - it looks great on him! Thanks Masha, it's hard to convey in photos just how great the fit and cut is. This is totally killer, dude!! (Not in the shark eating your kid sense, but in the surfer dude sense.) He would totally fit in in my neck of the woods, where the water is freezing and wetsuits are a year round necessity. And I'm sorry, but now you have to make him a catwoman-type outfit. Can't wait. This one is thin, but I'm sure in a thick, thermal weight Lycra it would be great for colder water swimming. Nope, sharks would never spot him ;) The swimsuit turned out great. He seemed to love the idea that he would be camouflaged with the water and I wouldn't be able to see him. Oh well, we stayed between the flags and I'm sure the lifeguards were watching the "invisible kid"
I knew these posts would be awesome! I love the skinsuit. This is the kind of suit I want for my daughters -- lots of good coverage!! Oh go on, make a full length white one for him. Imagine him in the pool, he will disappear. :) imagine if there was such a thing as tile print! Well done, it does look a perfect fit. Looking forward to seeing the 'catwoman' version sometime in the future! Quick, make it before he changes his mind!